Click through to view a short video about Hebrew manuscripts and their preservation by the National Library of Israel. Free registration is required. 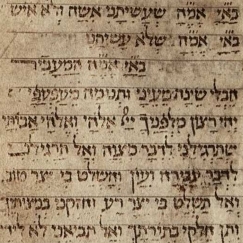 This site provides digital access to manuscripts and early printings as well as other books and documents as they relate to Judaism and Jews. Project that aims to provide centralized digital access to the complete corpus of existing Hebrew manuscripts. Provides digital access to major Jewish religious texts. Its digital programing allows for unique visualizations and interfaces that demonstrate, among other things, the interconnections between texts. Full text of the Bible and its major commentaries, the Babylonian Talmud with Rashi's commentary and Tosafot, the Jerusalem Talmud, the Mishneh Torah of Maimonides, Shulchan Aruch with commentaries, Midrashim, hundreds of books of Responsa, and the Talmudic Encyclopedia. Please note. This resource does not work with the EZproxy service. You must be connected to the campus network via SRA to view the content. Use Internet Explorer. Searchable digital collection of over 90,000 Judaic books, scanned page after page in their original format, encompassing all realms of Judaism from ancient times to the modern period. Includes a databank of Talmud manuscripts, fragments, and early printed editions, an index of references to scholarly and rabbinic literature dealing with specific passages in the entire Talmud and a classified list of Geniza fragments in the Jewish Theological Seminary Library. Online Treasury of Talmudic Manuscripts. Jewish National and University Library, The Hebrew University of Jerusalem. Includes images of major Talmudic manuscripts from libraries around the world. The manuscripts are entirely in Hebrew and Aramaic. Lists bibliographical references for passages in rabbinic literature and related subjects and connects them to the location within rabbinic literature to which they are related. Provides access to all quotes or references to Talmud Yerushalmi in medieval rabbinic literature, Geniza fragments, and other commentaries. These references provide rich information about any subject addressed in the Talmud Yerushalmi. A dictionary and concordance which includes the entire Hebrew lexicon throughout its history; presenting Hebrew words in their morphological, semantical, and contextual development from the first appearance in written texts to the present. Sources include the Dead Sea Scrolls, Inscriptions, Talmud and Midrash, Geonic Literature, Prayer and Piyyut, Karaite Literature, Sciences, Deeds, Colophons, Amulets, etc. Updated on a regular basis. Comprehensive bibliography of all books printed in the Hebrew Language between 1473 and 1960. Includes over 120,000 titles and 13,500 authors. TheThesaurus of the Hebrew Book lists printed Hebrew books by city. Database that tracks the circulation of printed "Jewish books" (in Hebrew, other Jewish languages, and books in Latin and non-Jewish vernaculars with Judaica contents).